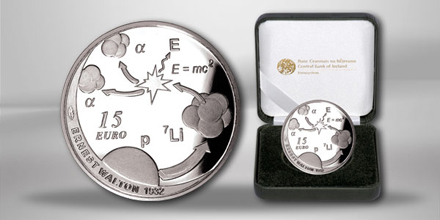 (mm) The second issue from the series "Irish scientists and inventors" – a 15 Euro silver coin (925/1,000; 6,000 copies in proof) – is dedicated to physicist Ernest Walton. In 1951 Walton and his colleague John Cockcroft were awarded the Physics Nobel Prize for building the first nuclear particle accelerator. The coin's reverse shows the physical process enabled by the machine. The viewer can see an accelerated proton splitting the core of a lithium atom discharging an amount of energy. Alongside the denomination is the Nobel Prize winner's name as well as the year date "1932" which marks the first time scientists were able to destroy the core of a lithium atom using accelerated protons. The obverse shows the Irish harp surrounded by state name and year of issue.